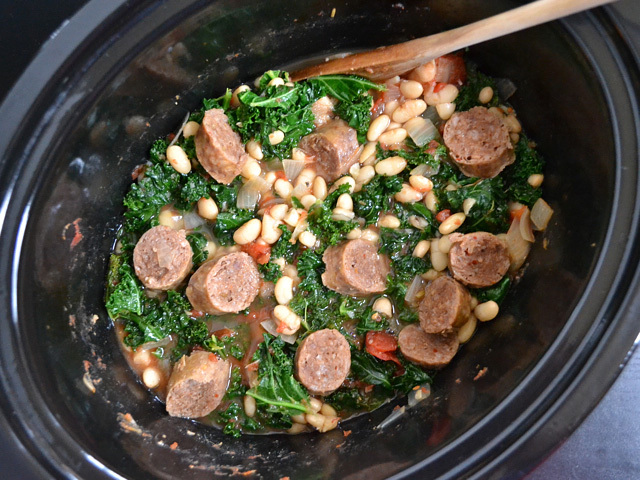 I know I’ve done the whole sausage-bean-kale thing numerous times, but that’s because it’s so good. This might not be a traditional cassoulet, but that’s the closest word I could find to describe what’s going on here. It’s beans slowly cooked with meat so that the rendered fat has time to soak in and give everything the most amazing flavor. 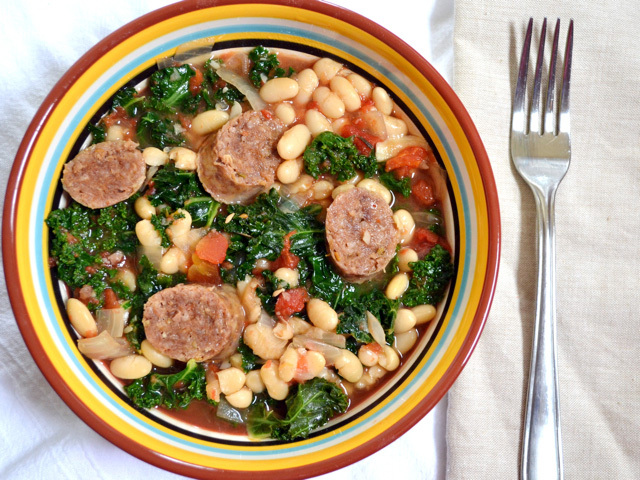 I added kale, which isn’t traditional in cassoulet, just so I could get some greens in there and have everything I needed in one bowl. If you’re not into kale, you can add a half bunch of parsley, which is much more traditional for cassoulet. This dish surprised me with it’s deep, rich flavor. It’s just a few simple ingredients, but tastes like a million bucks. I guess that’s why cassoulet has been one of those classic poor mans’ meals that has survived for centuries. It just works. Serve this with some fantastic french bread to sop up the wonderful liquid in the bottom of your bowl and you’ll be one happy camper. 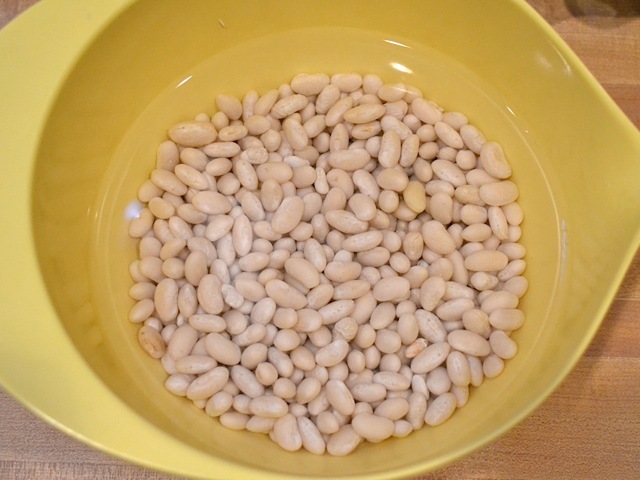 Pick through the beans to remove any debris and soak them in the refrigerator over night. The next day, dice the onion and peel the garlic. I didn’t even bother mincing the garlic, although you could if you’d like. This is the sausage that I used. I only used two links and froze the rest for later. 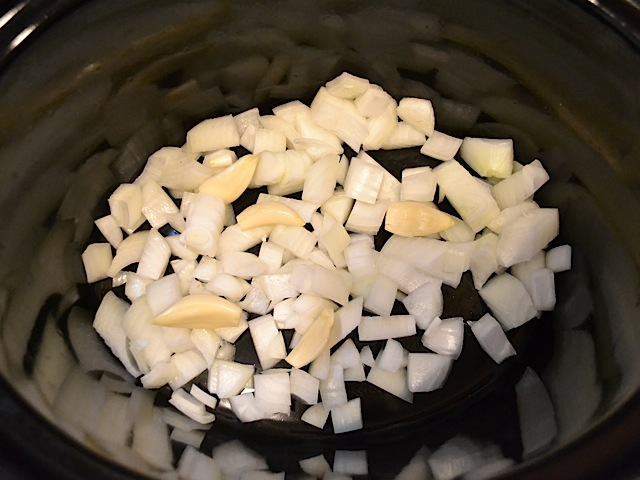 Drain the beans, rinse them briefly, and then place them in the slow cooker on top of the onions. 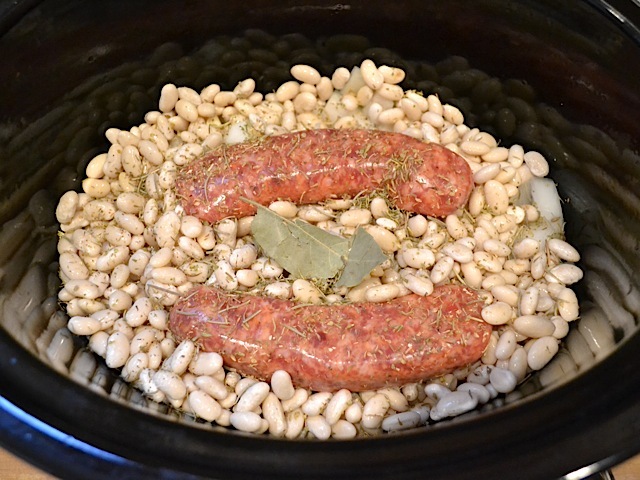 Nestle the sausage on top and then add the bay leaf, thyme, oregano, and rosemary. 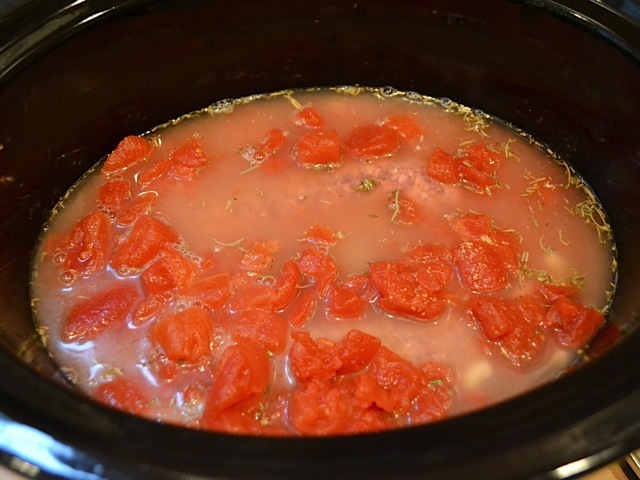 Lastly, add the can of diced tomatoes and the chicken broth. Place the lid on top and cook on high for four hours. After four hours, it’s fragrant, the meat is soft, and everything is delicious. Test the beans just to make sure they’re tender. Cook longer if needed. 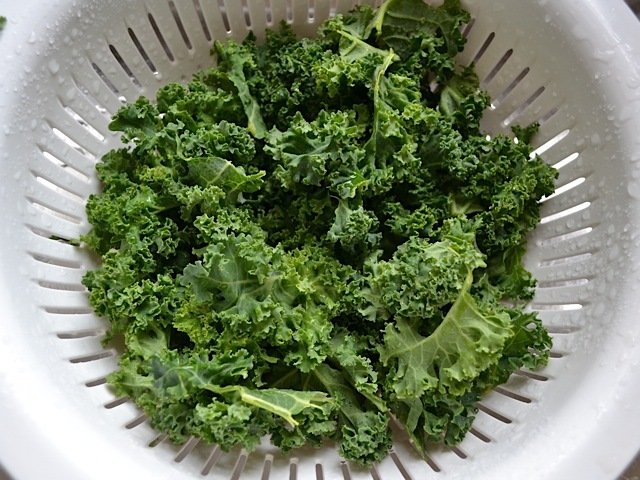 Tear the kale leaves off of their stems and into small pieces. Rinse them well with cool water. Add the rinsed kale to the slow cooker and stir it in until it wilts. 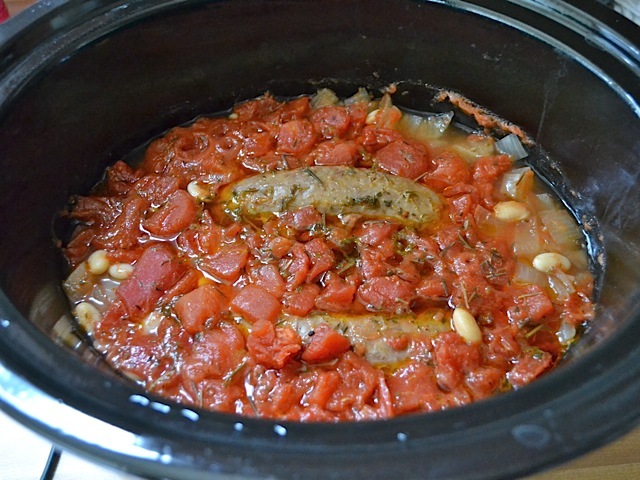 When you first put it in, it will fill the slow cooker up to the top, but it quickly wilts down from the heat. Taste it and add salt and pepper if you’d like. 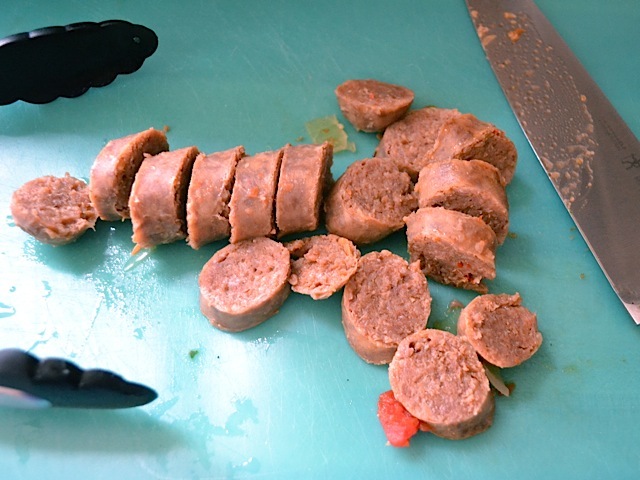 Slice the sausage and then add it back to the pot. And then you’ve got an amazing one pot meal! It’s seriously warm, delicious, and comforting. Hi, wondering if you have ever doubled this. If not, how do you think it would turn out? Thanks! I haven’t doubled it, but I think as long as your slow cooker is big enough to hold it, it should work fine. No adjustments needed. I’m sorry, I don’t have a reliable source for that information. While there are online recipe nutritional calculators, they’re not very accurate, so I don’t think it’s safe to provide that information. I tripled the recipe and it turned out just fine. I’m trying this again and soaking the beans in chicken broth overnight to see how that turns out. Love this recipe and think it would be great over rice, especially in the winter time. Wow, this looks delicious, I’m going to try tonight! Made this yesterday, and it was delicious! I never soak beans (I always forget), so I just cooked on low for 10 hours (I knew I’d be at work all day). I like that this is adaptable to whatever beans and greens you have on hand. I’m thinking of doing something similar with chorizo and pinto beans next time! I made this tonight. It was tasty, but it lacked some bulk. So, I’m going to try adding brown rice to it next time. Also, I’m not sure I liked the kale so I’m going to try bok choy. We’ll see how it goes. 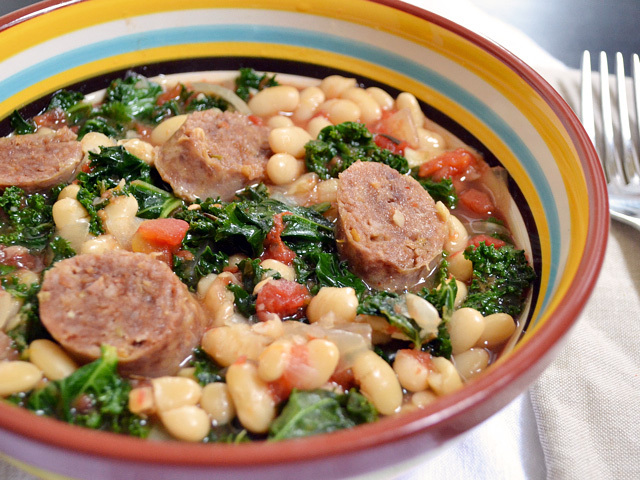 I’ve made the Sausage and Kale Cassoulet this morning, and honestly, it is AMAZING!! Although I didn’t have thyme and bay leaves, I had to use what I had on hand by adding rosemary and parsely. I served the cassoulet with dinner rolls-which was leftover from Thanksgiving. I was able to purchase a bunch of kale for $.98 cents, and that was a good deal. I will definitely make this recipe again, and hopefully, I’ll have bay leaves and thyme on hand. Hey, Beth. 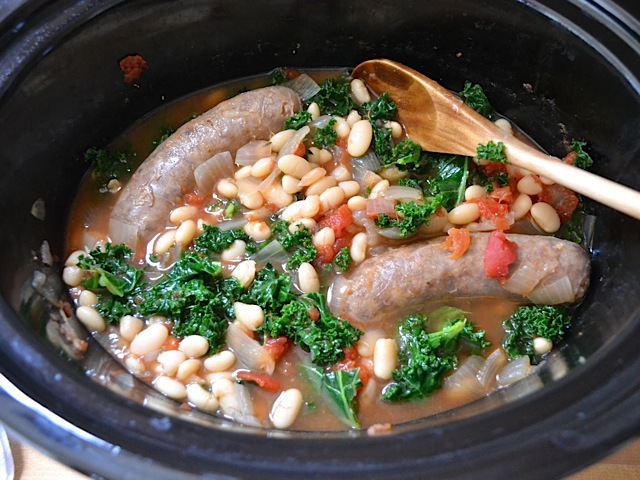 I’ll be making the Sausage and Kale Cassoulet tomorrow morning. Since I don’t have bay leaves, is it possible that I can omit that ingredient, or do you have any other alternatives? Thanks! The flavor of the bay leaf is very subtle, so I think you’ll be okay leaving it out. This recipe was delicious! I am definitely going to cook this again. 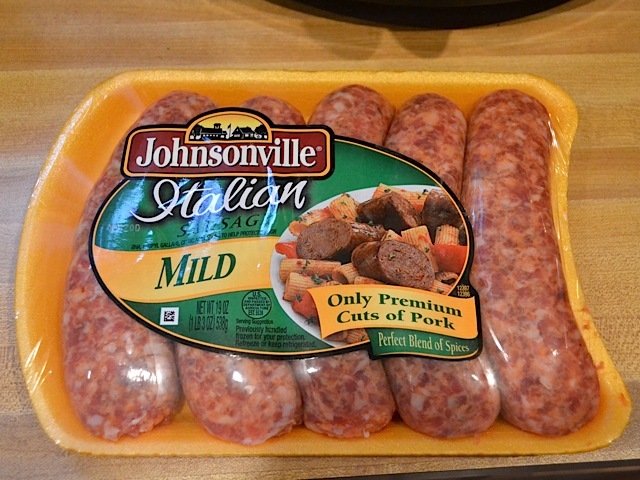 Instead of using a slow cooker, I cooked it in 30 minutes in my electric pressure cooker, and I used a different kind of sausage (nitrate free). This is a great economical and healthy recipe. 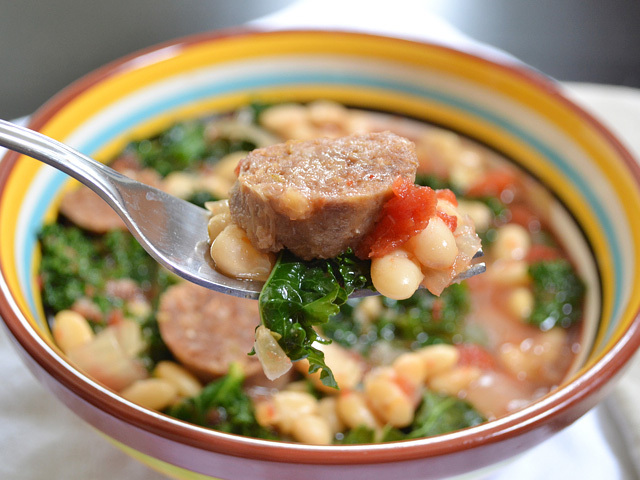 The Sausage and Kale Cassoulet looks so good, and I’m looking forward to making it! Is it possible that I can use canned beans instead? Yes, but you might not need any broth at all, since they’re already hydrated. This was a great winter meal. I ended up adding almost twice as much garlic but I’ve gotten used to the fact that I think I like garlic more than you. :-P. My girlfriend doesn’t like Kale but even she liked this. I have those same striped bowls from Mary Kay. Did you get them there as well? Set of 4 bowls and a big one? Delicious! I had canned beans and didn’t have four hours, so I just made this on the stovetop. Browned the sausage separately first (I used spicy Italian), sauteed the garlic and onions, then threw in all the other stuff. I used less chicken broth since the beans weren’t going to soak it up. It came out great! Will have to try it in the slow cooker sometime when I plan ahead better. Yum! This is a very forgiving recipe. We were out of onions (tragic! ), so I diced up some baby carrots. Increased the thyme since we didn’t have rosemary or oregano, and added some red pepper flakes. And I left out the tomatoes and subbed spinach for the kale. There was also some wonkiness with our slowcooker, so I think it cooked for too long. Still delicious! It was my first time cooking from dried beans, and I love how creamy they get! Any idea of calories etc per serving?